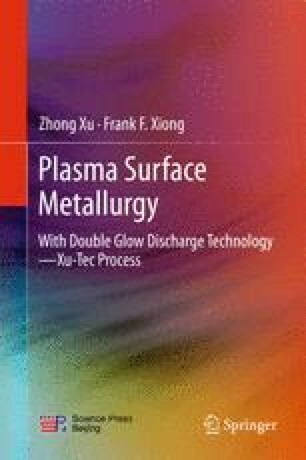 This chapter introduces the double glow plasma surface metallurgy technology, ranging from its basic principle for surface alloy formation and mechanism of alloy element inter-diffusion, to the operation processing and results. The hardware configuration for the working-piece, the source electrode, gap protection and cathode power transmission device are described. The influence of the main process parameters on the surface alloying layer and the discharge modes, arc discharge and its causes are discussed in detail. In addition, some collective processing experience and the operational requirements are also introduced and discussed. The advantages of the Xu-Tec process for surface alloying treatment and its development history in China and in the USA are briefly presented.